as his three sons were also well known flower painters themselves although not as famous as their father. His brother in law, Balthasar Van der Ast was also a great painter, he took a young man named Jan Davisz de Heem as an apprentice who later became a master himself. 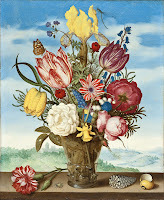 In other words, when comes to this style of still-life Bosschaert’s bouquets of flowers were of great influence. At right “Bouquet of Flowers on a Ledge”, you can see the original painting at the Los Angeles County Museum of Art. Below my own adaptation of Bosschaert’s masterpiece using today’s flowers. You can explore it by also clicking on it. One of the reasons these paintings were so popular among the wealthy in XVII Century Holland is because paintings were considered to outlast nature and life. A painting with a bouquet of flowers was also a secure way to have beautiful, colorful flowers to break the dull colors of winter. These paintings had flowers that were from different times of the year and as such impossible to gather in a bouquet. Bosschart and other Dutch masters sketched them while they were available and then assemble them into bouquets. I absolutely love these paintings, it has been a great project to use them for inspiration. I did not intend to exactly replicate Bosschaert’s painting, but to use it as a model to emulate. For the bouquet's background, I chose a flat landscape because in my opinion, it would be a more realistic representation of a Dutch landscape which notably lacks hills or elevations.